Texas Attorney General Ken Paxton has been indicted by a Collin County grand jury, Dallas-area media reported Saturday, citing sources close to the case. Texas Attorney General Ken Paxton has been indicted by a Collin County grand jury, Texas and national media reported Saturday, citing unnamed sources close to the case. Paxton faces three charges in indictments that were issued Tuesday and instantly sealed, according to NBC 5. The charges will be revealed Monday in McKinney, and a Tarrant County judge has already been tapped to oversee the case, WFAA reported. Kent Schaffer, one of two special prosecutors who took the Paxton case to the grand jury, told The New York Times that the indictments include three felony counts — two alleging first-degree securities fraud and another alleging a third-degree charge that he failed to register as a securities agent. Schaffer said Paxton is accused of encouraging others to invest more than $600,000 in a company called Servergy Inc. without telling them he was making a commission and misrepresenting himself as a fellow investor. The grand jury also charged him with failing to register with state securities regulators for soliciting clients for Mowery Capital Management in return for fees. Joe Kendall, Paxton's attorney, issued a written statement Saturday evening, saying, "Judge Gallagher has specifically instructed both parties to refrain from public comment on this matter and we are honoring the Judge’s instructions." That statement marked the first public notice that the case has been assigned to state District Judge George Gallagher of Fort Worth. Wice and Schaffer issued a statement at about the same time as Kendall, reiterating their roles in the legal process. "As defense attorneys, we have dedicated our careers to ensuring that every citizen accused of any crime is afforded the fundamental constitutional guarantees of the presumption of innocence, proof beyond a reasonable doubt, and a fair trial with a reliable result," they said. "Because our statutory mandate as special prosecutors is not to convict, but to see that justice is done, our committment to these bedrock principles remains inviolate." Paxton's spokesman, Anthony Holm, has criticized the investigations into the attorney general as politically motivated from the start. Others have been more circumspect, but said other prosecutions raise the specter of politics in such investigations. "I think you have just a little bit of caution with it," said state Rep. Matt Krause, a Fort Worth Republican who is friends with Paxton. Krause pointed to the current abuse-of-power indictment against former Gov. Rick Perry, one count of which was recently dismissed. "I think it's all seen within the same universe of what's taking place, and that's why people are quick to think there's a political motivation or agenda behind it," Krause said. Krause said Paxton, like many others, has been waiting to hear more details about the potential case against him. "He always seems upbeat," Krause said. "I think he feels like a lot of people do: I'm not going to put my time, effort and energy into it until we know something serious about this." Democrats pounced on the news of Paxton's indictment, calling it a result of the GOP's longtime hold on state government. Manny Garcia, the deputy executive director of the Texas Democratic Party, said in a statement that the case is "yet another example of the corrupt culture that fester with one-party, unchecked Republican power." And Texans for Public Justice, a liberal-leaning group that pressed for Paxton's prosecution, met the news of the indictments by urging his resignation. "The only acceptable response to today's indictment of Attorney General Ken Paxton is his resignation," said TPJ's Craig McDonald. "The state's highest law enforcement officer must be held to the highest standards of conduct. 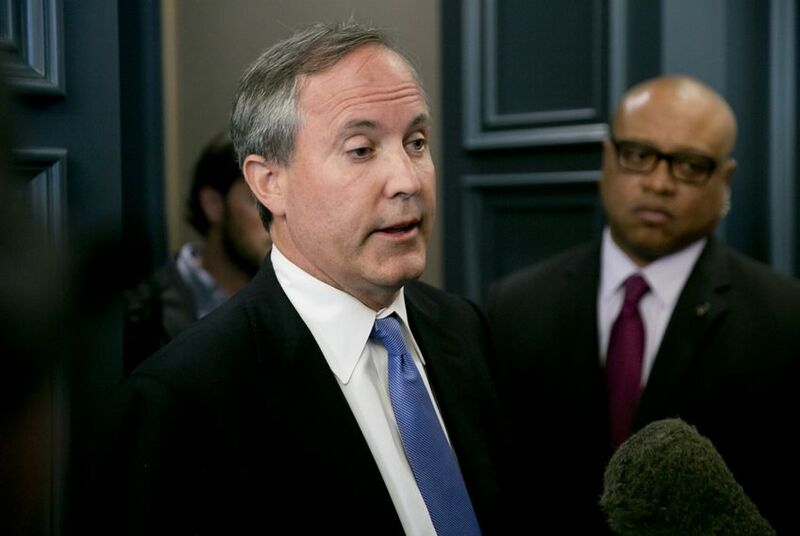 Ken Paxton's behavior disqualifies him from serving as Texas' top cop." The two special prosecutors, Schaffer and Brian Wice, have been presenting evidence to the grand jury in connection with Paxton's self-admitted violation of state securities law. Schaffer had previously said he and Wice would pursue an indictment for first-degree felony securities fraud. Conviction on a first-degree felony carries a penalty of 5-99 years or life in prison and a $10,000 fine; on a third-degree conviction, it’s 2-10 years and a $10,000 fine. Paxton admitted last year that he solicited investment clients for a friend and business partner at Mowery Capital Management without properly registering with the state. He was reprimanded and fined $1,000 by the State Securities Board. Schaffer and Wice, both attorneys from Houston, were selected to look into Paxton's admission after Collin County District Attorney Greg Willis, a friend and business partner of the attorney general, stepped aside. State officials do not have to step down from office if they are indicted, but convicted felons cannot serve. Paxton is not the first statewide elected official in Texas — or even the first attorney general — to be indicted while in office. The indictments add his name to a list of accused Texas officeholders that includes then-Gov. Rick Perry, then-Treasurer Kay Bailey Hutchison and then-Attorney General Jim Mattox. Former Attorney General Dan Morales was indicted and convicted after leaving office on charges that arose from litigation between the state and several big tobacco companies while he was AG. Perry’s indictment is pending. Hutchison and Mattox were acquitted and went on to win elections after their legal troubles were behind them. Morales served time in federal prison. Another potential problem for Paxton is the cost of defending himself. If he were charged for something he did as a state officeholder or as a candidate, his campaign funds could be used to pay the lawyers who defend him. In the case of charges that stem from his private or personal business activities, his campaign funds are out of bounds, according to experts in state ethics laws. Paxton would have to pay for his defense out of personal funds or find some way to set up a separate defense fund that could solicit contributions on his behalf.